For some reason an old post from this past winter has popped up as my most current post. I edited a category on it and Blogger decided to give it a new publish date of July 19 or something like that. It's like Christmas in July. Or in this case, winter in July. Anyway, it got me thinking, why not post about summer outings for toddlers as well. Summer outings require much less creativity than winter outings, but still take a bit of thinking and planning as 1. you can only do the playground so many times before you just can't stand it anymore (let's be real, Eli could go a million times and not get bored but I can't handle it every day. Maybe that makes me a bad mom, I don't know, but I'm just being honest here) and 2. it's friggin hot outside so finding activities where you can stay relatively cool is a must (also a reason I can't handle the playground everyday...too hot!). This summer, we've had lots of fun in the sun while still managing to beat the heat so this week I will highlight some of our fave outings so far. A friend and I headed out to Donaldson's Farm in Hackettstown for pick your own strawberries. We wanted to go on the weekend, when they have more going on (i.e. strawberry milkshakes!!!) but it didn't work out with our schedules so we settled for Monday morning. While there weren't strawberry milkshakes, it was nice that it wasn't crowded. We had the patch pretty much to ourselves which was great given that Eli liked to run down the rows. I didn't have to worry about him getting in anyone's way. I wasn't sure if he'd be into the actual picking, but he loved it! And once we helped him choose the red ones instead of the white ones, he did really well. He picked his own basket of nice red strawberries and sampled a few along the way. That may have been the moment when it really sunk in for him that the red strawberries were what we were after. Ha! Some things in life we have to just learn through experience. Last year my sister and I went to Alstede Farms for our first pick your own experience. Alstede certainly had a much bigger variety of fruits and vegetable to choose from, but it was so big and overwhelming that it was almost too much for us, and it was definitely too much for Eli. Donaldson's was much more manageable, especially for little ones. 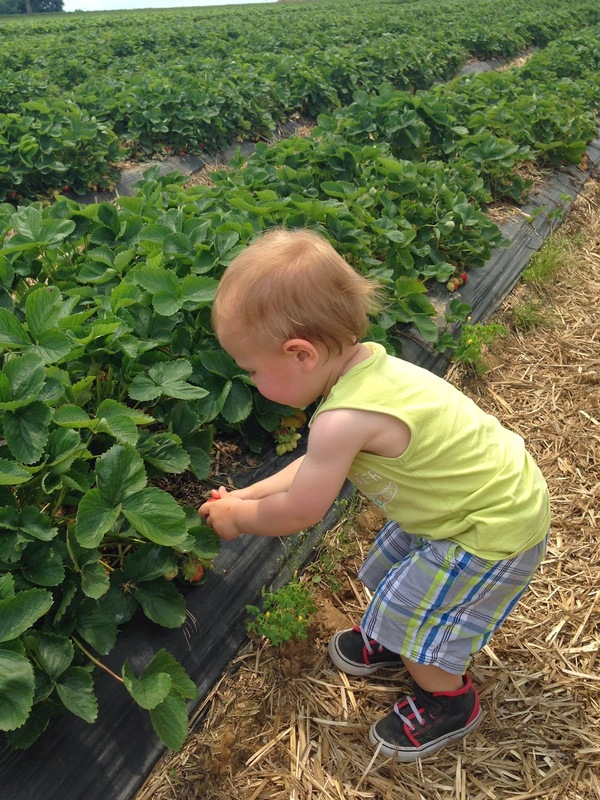 Another great thing is that they have things to do besides picking berries, which given a toddler's short attention span for almost any activity is a must. and an awesome sandbox that is completely shaded because it is built around a huge old tree. If you are in the northern New Jersey area, check out Donaldson's Farms in Hackettstown. In the summer they also have Summer Nights on the Farm every Friday night where they offer farm fresh food and pony rides for the kiddos. Hopefully one of these days we can check that out as well. We will definitely be back there at least once more this summer and most likely in the fall for some pumpkin picking with Eli and maybe even our new little pumpkin depending on when he or she decides to arrive. More summer fun with a toddler to come later in the week!